Could there be anything more exciting at a zoo than a baby animal? Babies bring hope for the future and an opportunity to learn more about a species, not to mention the promise of some entertaining antics. Unfortunately, new arrivals don't always go as planned. Staff may need to intervene for the safety of mother and/or child. It may be a difficult birth; the baby may not be healthy, or a mother may even reject it. I first came across documentation of such a situation in the papers of Marion P. McCrane, a zoologist at the Smithsonian's National Zoological Park. 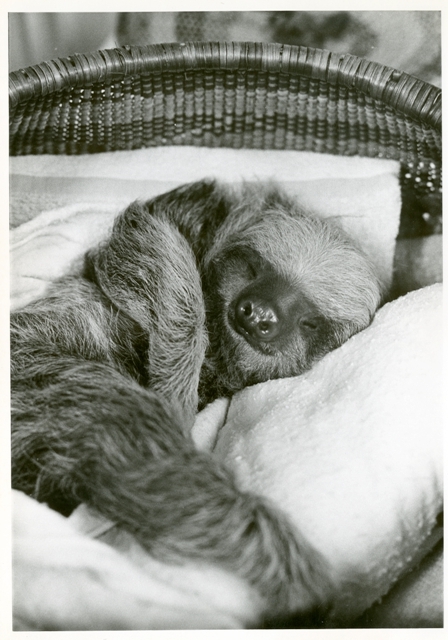 On July 31, 1964, a two-toed sloth was born and found on the floor of the enclosure a few hours later. The baby sloth (named Mary Jane long before it was determined that it was a male) was taken to the zoo hospital where he was given rolled up towels to simulate his mother and was fed a mixture of evaporated milk and water. 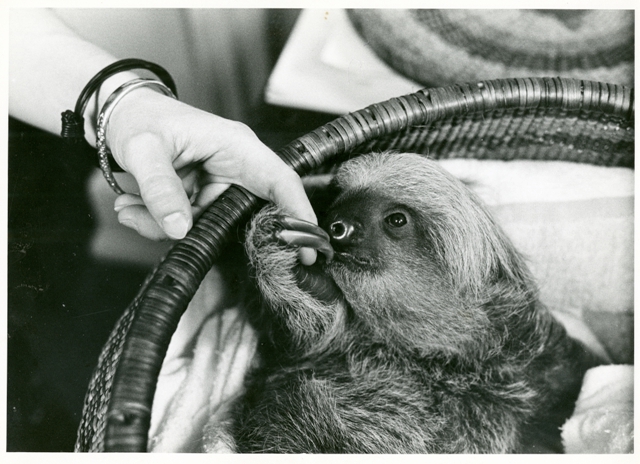 According to Ms. McCrane in an article she wrote for the International Zoo Yearbook, "no reason was found for discontinuing the hospital care except that the author found the little sloth quite irresistible." Two-week old Mary Jane came to be hand-reared by Ms. McCrane in her own home and often commuted with her to work. Mary Jane initially slept in a basket, full of towels, fake fur, and a hot water bottle to simulate living with his mother. Ms. McCrane was also obliged to provide Mary Jane with all of the cuddling and snuggling that his mother would have provided, although it doesn't seem that she particularly minded this part of the job. As he grew older, Mary Jane's quarters became more elaborate and he was given more freedom to roam. He was particularly fond of hanging from the bed slats near the radiator. Hand-rearing isn't all fun and games though. Ms. McCrane—the first person to successfully hand-rear a two-toed sloth—scientifically documented her experiences and observations during the first eight months of Mary Jane's life for the benefit of others who might wind up in a similar situation. Mary Jane certainly wasn't the first animal to be hand-reared by National Zoo staff (and their wives) in their homes. 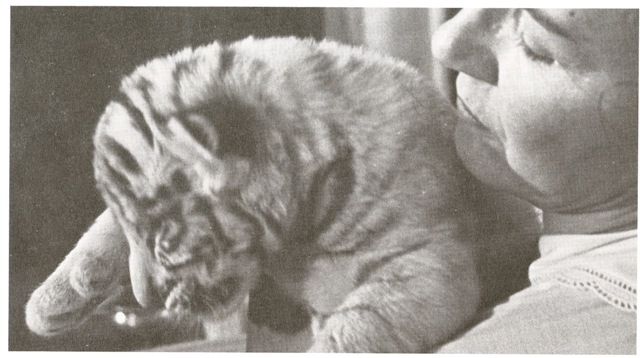 In a blog post this past fall, Reference Archivist Ellen Alers mentioned the tiger cubs and birds that Director William Mann and his wife, Lucy, raised in their house. Elizabeth C. Reed, wife of Director Theodore H. Reed, wrote in the April 1970 issue of National Geographic, "I've been foster mother to four hybrid bears, one grizzly cub, and two young leopards. Oh yes, and to a ring-tailed lemur that used to perch on my shoulder drinking orange juice." The article, a copy of which is in our collections, goes on to describe her experiences raising a white tiger (the first of at least two that she reared). 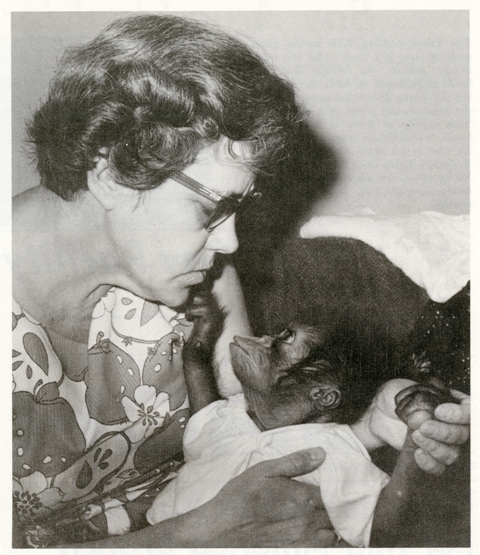 According to the June 1969 issue of the Smithsonian's staff newsletter, Louise Gallagher, wife of Animal Keeper Foreman Bernard F. Gallagher, served as substitute mother to the Zoo's apes for over twelve years starting in the latter half of the 1950s. She found that raising apes was similar to raising human children and that her first orangutan developed at almost the same rate as her neighbor's child of the same age. Even though she had no formal zoology training, the National Institutes of Health considered her enough of an expert to request her advice on raising chimpanzees. Mrs. Gallagher noted that it was often a tough transition for the apes to be reintroduced to the zoo, but, as with the other hand-reared young animals, they were returned once they were mature enough to survive on their own.